Planning a trip to New York? How about a scenic road trip that takes you beyond the attractions of New York City along routes in upstate New York? “So good they named it twice” sang Gerard Kenny about New York. Many international travellers are drawn to the Big Apple for city breaks but there’s much more to New York than merely Manhattan and the other four boroughs — Queens, The Bronx, Staten Island and Brooklyn — that make up the city that reputedly never sleeps. The state, of the same name, stretches up to the border with Canada and abuts New England, and is a rewarding place to explore by road. At its extremities, the Empire State runs east-west for 455 kilometres and north-south for 530 kilometres, making it the 27th largest in the United States. Its southern tip is washed by the chilled water of the Atlantic Ocean while its north is lapped by both Lake Eerie and Lake Ontario. That expanse provides plenty of territory to discover while driving. Yellow taxis on the streets of Manhattan. New York has numerous scenic driving routes. Route 20 runs all the way between Massachusetts and Oregon, slicing through New York between Buffalo and Albany, the state capital. Just as Broadway, in New York City, evolved along a footpath that was long followed by Native Americans, this highway was built along a historic trading route. Stopping in Albany means an opportunity to view the grand state capitol building, which took three decades to construct and can be visited free-of-charge, plus the State Museum, whose exhibits give insights into New York’s geology, heritage and nature. The road skirts past the northern tips of the Finger Lakes, close to Seneca Falls. If you enjoy nature, set aside time for a visit to Montezuma National Wildlife Refuge where bald eagles can be seen soaring. They are just one of around 250 species of birds that find habitat in the refuge. North America’s only marsupial, the Virginia opossum, counts among the 42 species of mammal living within the area. Buffalo — the location of one of architect Frank Lloyd Wright’s most celebrated designs and a national historic landmark, Darwin D. Martin House — proves a good base for a day trip to the nearby Niagara Falls. Sunlight behind the skyscrapers of Manhattan seen from New York’s Brooklyn Bridge. The Catskill Mountains run through south-eastern New York State, a region renowned as a country retreat for city dwellers. The verdant countryside is dotted with luxury real estate. Attractions such as North America’s longest and fastest zip lining network, at Hunter Mountain, plus scenic mountain biking on the Elm Ridge Trail, make the area popular with visitors of all ages. Allow time to take in the scenery at rustic settlements along the Delaware River. If adventure activities are your thing consider heading out onto the water. Pack a picnic, as there are plenty of spots to eat while enjoying nature. Route 30 heads north-east from Hancock, ending north-west of Albany. Cherry Ridge Wild Forest is a good place to park up and hike to enjoy the country air. Vroman’s Nose — a crooked, tree-covered prominence that provides fine views of the Schoharie Valley — is another natural landmark that warrants stopping for a walk or, at the very least, a photo. 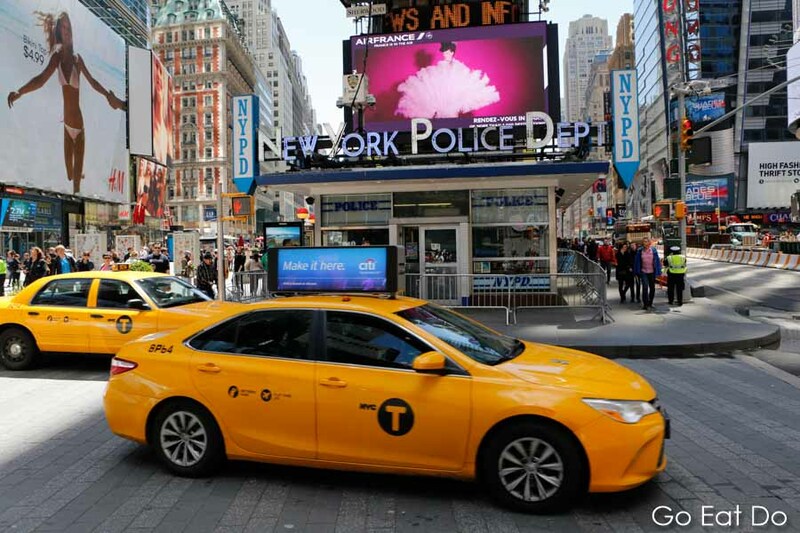 A yellow cab at Times Square in New York City. Baseball is America’s summer sport. Taking in a ball game while slurping cola and munching fast food is a way of experiencing American life. You can do that at countless minor league games across the state. Alternatively, head to Yankee Stadium, in the Bronx, or Citi Field, in Queens, to watch one of New York’s major league teams. Four hours’ drive north of the Big Apple lies Cooperstown, home to the National Baseball Hall of Fame and Museum. It tells the story of the game and displays artefacts that have been worn and held by the sport’s biggest names. A self-guided tour means, like the drive northward, you do it in your own time. The quickest way of reaching Cooperstown is along Interstate 87 but heading east at Lincoln Park means being able to enjoy the Slide Mountain Wilderness and snaking along backroads that provide insights into rural and small-town America. You’ll pass places where kids have swapped baseball cards and idolised players for decades. 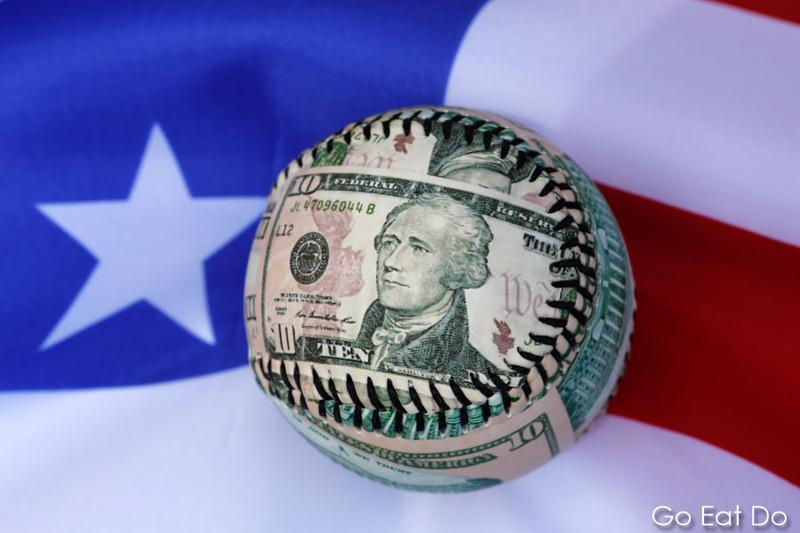 Baseball is much more than money ball. Take in a game at Yankee Stadium in New York City then drive to the National Baseball Hall of Fame and Museum in Cooperstown. To enjoy water and wildlife head north-west out of Buffalo on Interstate 90. Running for more than 4,861 kilometres, the trans-continental road is the USA’s longest interstate highway. Turn north at Indian Falls and visit Iroquois National Wildlife Refuge, an area encompassing swap, woodland, meadows and lakes. Pack a long lens if you enjoy photography — Canada geese can be spotted, along with muskrats. Turning east at Medina leads to Niagara Falls, where water tumbles over three ledges — the American, Bridal Veil and Horseshoe Falls — splashing up spray. Remember to pack a dry cloth to wipe the lens of your camera or phone, and leave a towel in the car, just in case. Afterwards sweep south-west along Route 5, fittingly known as Lakeshore Road, to visit small towns on the Lake Eerie waterfront, including Angola on the Lake and Van Buren Point. 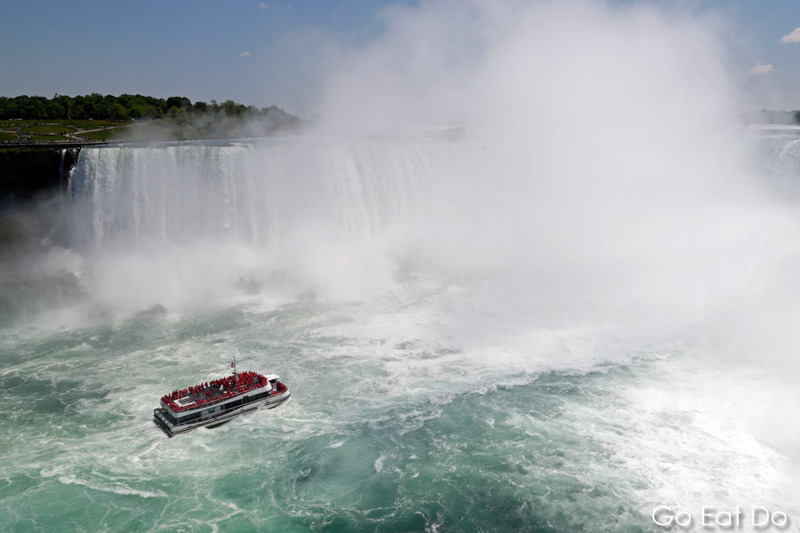 Hornblower Niagara Cruises sail close to the iconic Horsehoe Falls at Niagara. From Syracuse — where you can view the impressive Art Deco façade of the National Grid Building, featuring the metallic Spirit of Light figure — drive north-east to the St Lawrence River. Thousand Island Park, founded as a camping ground, is peppered with heritage buildings, making it a good spot to take a break on the American side of the Thousand Islands. Continuing along the southern side of the waterway, towards Cornwall, allows you to peek across into Canada and drive across the St Lawrence towards Gananoque on the Canadian side of the Thousand Islands. One of the best ways of getting an overview of the region and viewing highlights is by taking a ride along the Saint Lawrence in a helicopter. Thousand Islands Helicopter Tours depart from a helipad in Gananoque. You can then veer north, towards Montreal, or east, to Vermont. Heading south, via Malone, allows you to pick up Route 30 and swing by the High Peaks Wilderness, as a scenic alternative to driving back to New York City on the interstate. 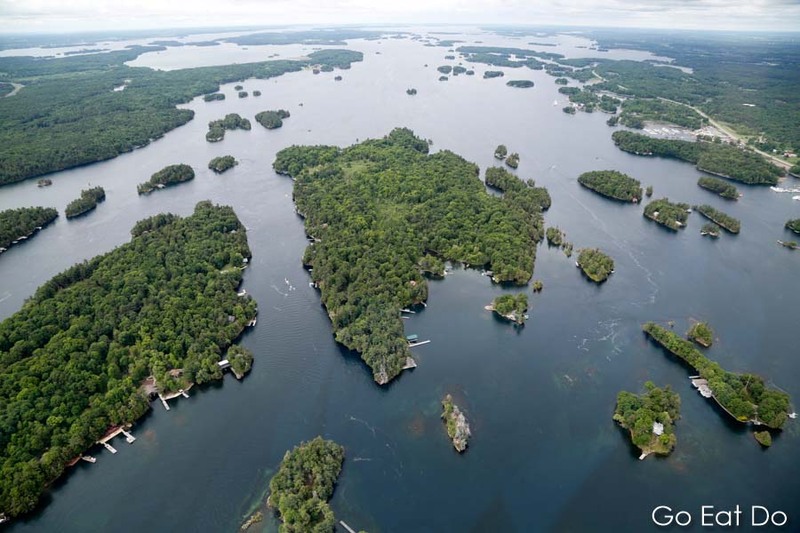 A view of some of the St Lawrence River and some of the verdant isles of the Thousand Islands seen during a tour operated by 1000 Islands Helicopter Tours. See the I Love NY website for information about places to visit and things to do in the state of New York. The Visit The USA and Visit USA have a wealth of information about destinations in New York and elsewhere in the United States of America. Photographs illustrating this post are by Why Eye Photography. Commission a shoot by calling 07947 587136 or making contact via the Why Eye Photography website. Stuart Forster, the author of this post, is an award-winning travel writer. He was named Digital Influencer of the Year at the 2018 Holland Press Awards. Stuart is based in the north-east of England and available for magazine, newspaper and online commissions. Please make contact via this website if you want to commission work or sponsor a post on Go Eat Do. Yellow taxi cabs in New York City. Really nice and complete article on New York.